In a small bowl, whisk together the teriyaki sauce, sugar, and garlic until sugar dissolves. 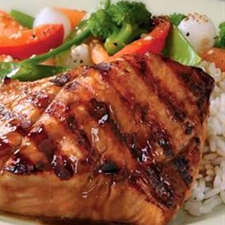 Place salmon fillets in a large bowl and toss with marinade to coat fillets. Cover with plastic wrap and refrigerate at least 30 minutes. Lightly coat clean grids of grill with cooking oil spray. Heat grill to medium heat. Remove salmon from marinade. Arrange salmon fillets, skin side down, evenly on grill and cover with lid. Grill without turning fillets, 8 minutes. Using a large spatula, carefully turn fillets and cook, covered, 2 to 3 minutes longer, just until salmon is cooked through but still moist and flaky. Per Serving (per 6 ounce fillet): 248 Calories; 6g Fat (21.9% calories from fat); 1g Saturated Fat; 36g Protein; 11g Carbohydrate; trace Dietary Fiber; 88mg Cholesterol; 1343mg Sodium. Exchanges: 5 Lean Meat; 1 Vegetable; 1/2 Other Carbohydrates.